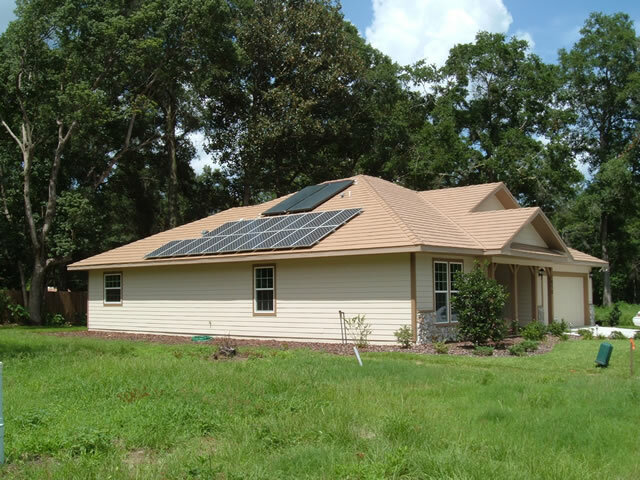 This research site monitors the electrical consumption as well as the interior space conditions of a near zero energy home in Gainesville, Florida. It is a 1,772 sqft, single story, three bedroom/two bath home with a preliminary HERS rating of 27. Energy consumption is offset by a 3,150 watt photovoltaic system. It has an R-38 insulated ceiling, double pane low e windows, radiant barrier decking, and reflective metal shingles. Space conditioning is accomplished by 95% AFUE gas furnace and a SEER 19 variable speed air conditioner with all the duct work contained within the conditioned space. All appliances are Energy Star rated and hot water is provided by 80 square foot/120 gallon drainback solar hot water system. All solar systems face west and it is occupied by a family of two. Data collection began in July 2008.